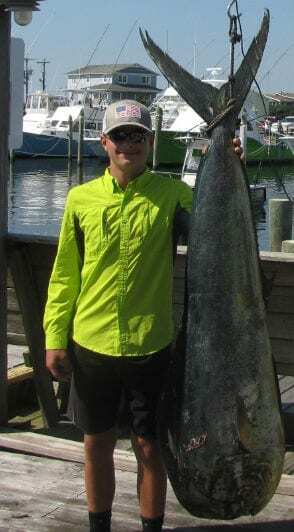 A teenager from Georgia boated a possible new world junior angler record for the largest dolphinfish while fishing out of Hatteras Inlet. Lucas Duke, 14, of Dexter, Ga., caught the 72 pound, 14 ounce mahi mahi on Tuesday aboard the Wasabi out of Teach’s Lair Marina. According to the International Game Fish Association website, Duke’s catch would shatter the previous boys junior record of 61 pounds, 8 ounces caught in the Gulf of Mexico off Louisiana in 1999. While the fish earned a citation award from the N.C. Saltwater Fishing Tournament for Duke, besting the 35 pound minimum, it came up just short of setting a new North Carolina mark. Sean J. Yurkanin caught a 79 pound mahi mahi fishing out of Hatteras in 1993. The world all-tackle record for dolphin is 87 pounds, which was caught in the Papagayo Gulf off Costa Rica in 1976. The record certification is subject to rules of the IGFA. Junior angler records do not have line classes.